We’d seen the weather forecast. We were prepared for wet conditions, given the 90% chance of rain. But snow never even entered our minds. Not far into our journey away from Calgary toward Banff, the raindrops assumed a thicker, fatter quality and the realization of what we were seeing dawned on us all at once. 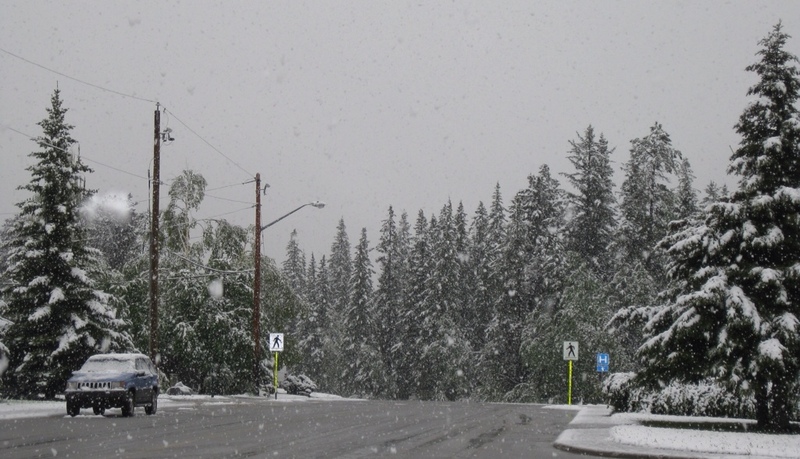 By the time we reached Canmore and stopped for lunch, the accumulation was undeniable. Trees were straining under their heavy white burden, and green grass had been replaced by a snowy blanket. We settled into a local restaurant, enjoyed exceptionally good food, and had a good laugh at Mother Nature’s joke. Rainy weather was just unpleasant. But snowy weather on June 9 was an adventure. If we learned anything about the Canadian Rockies today, it was how quickly conditions could change. We gradually left the snowfall behind, replacing it with drippy skies, clouds, and the occasional burst of sunlight. 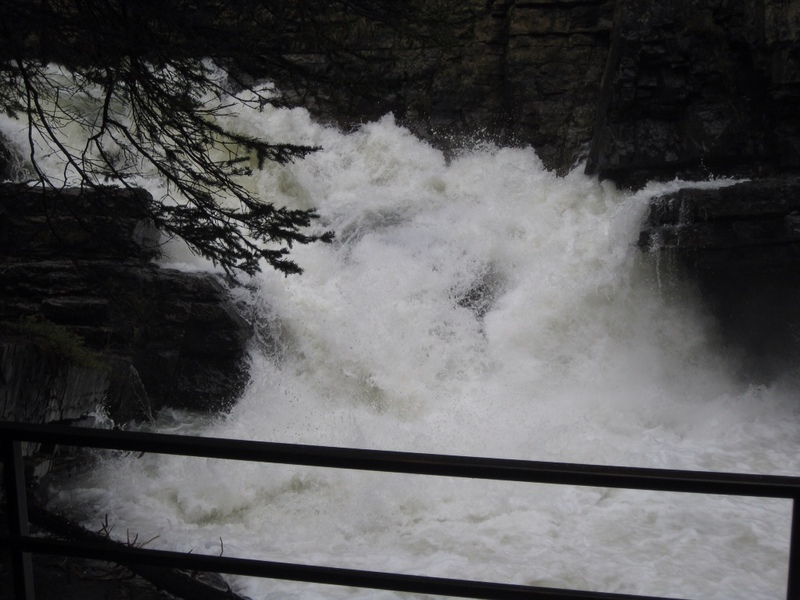 Hiking through Johnston Canyon, we managed to stay mostly dry while marveling at the thunderous volumes of water plummeting down the river. The brown swirling current raced by at a torrential pace, exceeding the boundaries of its normal banks, and showering us with spray at its waterfalls. Traveling the Bow Valley Parkway to Lake Louise, we were rewarded by lifting clouds that rose enough for us to see the towering mountains beyond the pine trees lining the road. The dark formations of the peaks, largely covered in snow were majestic and particularly stunning in contrast with the greens of the pines and the growing blue patches of sky beyond. We were surrounded by mountains in all directions, alternately materializing and slipping away behind swirling clouds. We finally knew we had arrived – Canadian Rockies, Day 1. Snow and all. 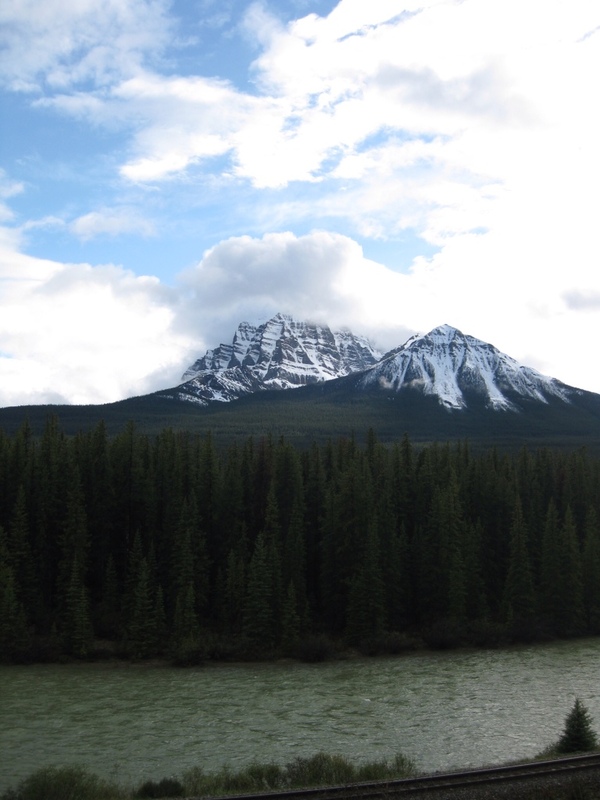 This entry was posted in Outdoors, Travel and tagged Banff Alberta, Canadian Rockies, Hiking, Outdoors by Molly. Bookmark the permalink.